Demonstrators outside Miami International Airport Sunday protesting President Trump's immigration executive order. The Trump Administration on Friday unveiled a series of immigration restrictions and temporary travel bans that quickly become flash points nationwide for immigration, terrorism, and national security. The new restrictions, abruptly introduced Friday in the name of "protecting the nation from foreign terrorist entry," blocked travelers from seven Muslim-majority countries: Iraq, Syria, Iran, Sudan, Libya, Somalia and Yemen. The orders created confusion and uncertainty for travelers and sparked protests at airports across the country, including Miami International Airport. A federal judge soon stayed portions of Trump's executive order, but the Department of Homeland Security says the president's orders "remain in place" and that "the U.S. government retains its right to revoke visas at any time if required for national security or public safety." WLRN reporter Tim Padgett provides an update on protests in Miami and the reaction from travelers in South Florida. Immigration attorney Lindsay Ray with Amigos Center provides an explanation of visas, green cards, and the difference between refugees and others seeking a home in the U.S.
Iranian-American artist Leila Mesdaghi discusses how her family and friends in Iran, and others holding dual citizenship in Iran, face uncertainty under the new travel laws. Mohammad Al-Darsani, a Syrian-American whose family members have fled Syria as others died in the country's ongoing civil war. He's also an imam with the Fort Myers Islamic Center for Peace. 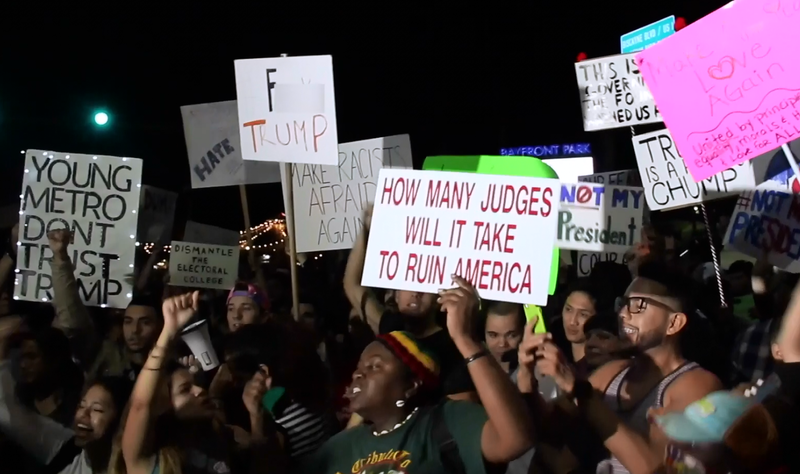 Miami joined the growing list of cities to host Anti-Trump protests Friday night, following president-elect Donald Trump’s victory last Tuesday. Miami Police said there were more than 2000 people involved. That crowd included FAU student Caitlyn Rittenhouse, who said she has concerns about a Trump presidency as a member of the LGBT community. 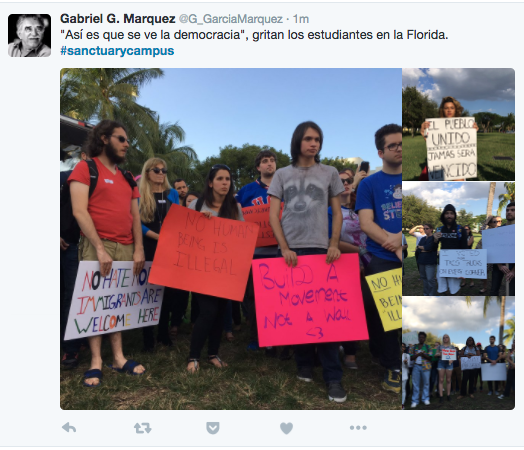 Students from Miami Dade College’s Homestead campus and several area high schools staged a walkout Wednesday to protest the immigration proposals of President-elect Donald Trump. The students rallied outside Homestead City Hall to push for an ordinance to declare Homestead a “Sanctuary City" and ask administrators to make each of their schools so-called sanctuary campuses.